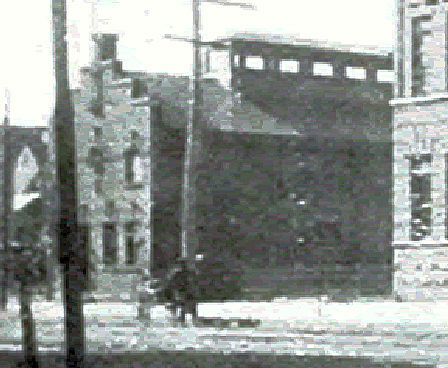 The Summer Avenue Bath House was erected in 1896. It was constructed of brick, with brownstone trimmings, and is furnished with 33 dressing rooms and a swimming pool 17 by 75 feet in size. The total cost of this bath was $14,500, of which $14,000 was paid for the building and equipment and $1,500 for the land. The bath house was open to males four days a week, and to females two days. The usual bathing hours were from 9 to 12 in the forenoon, and from 2 to 5 in the afternoon. Workingmen and others unable to bathe during the day are admitted between 6:30 and 8:00 in the evening In extremely warm weather the baths are open to men and boys from 7 to 10 AM on Sundays. The employs two superintendents and a fireman. There is also a matron who has entire charge of the days reserved for women and girls. The water in the swimming pool is kept uniformly at about 80° F., while persons using the showers can regulate the temperature to suit themselves. The pool is emptied and thoroughly cleansed once each day. Bathers who bring suits and towels are admitted free, while those who do not are charged a fee of 5¢ for the use of these articles, or 10¢ if a dressing room be included. Instruction in swimming is provided by competent teachers. The superintendents and other attendants are instructed in the treatment of the apparently drowned, and also life lines are stretched around the pools for the assistance of bathers in distress. The Summer Avenue Bath House had 29 showers with a average daily attendance of 164 men and 33 women.